Fact: Tom Brady is the greatest quarterback in NFL history. And in Tom Brady vs. the NFL author Sean Glennon sets out to prove it. 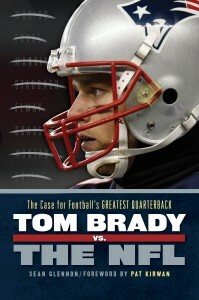 More than just a biography, this unique book establishes Brady’s prominent place in NFL history. Examining Brady’s skills and statistics and comparing him to other great QBs — including Peyton Manning, Brett Favre, Joe Montana, Bart Starr, Johnny Unitas and Roger Staubach — illustrates why New England’s field general is the best there is, was, and perhaps ever will be. The New England Patriots are the NFL’s undisputed team of the decade, the first professional football dynasty of the 21st Century. But as long-time fans know all too well, the road to greatness was anything but smooth. From their earliest seasons as one of the original American Football League franchises until the onset of the Bill Belichick-Tom Brady era, the Patriots offered plenty of thrills, but always found a way to break fans’ hearts. The glory years have been well earned. 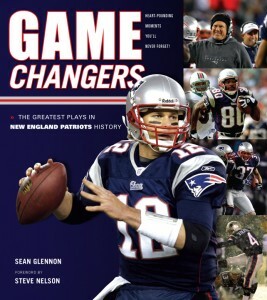 Game Changers: The Greatest Plays in New England Patriots History is about the big moments that have separated triumph and tragedy, the times when one play — one great cut, one lucky grab, one missed tackle — altered the course of a game, a season, even an entire era in franchise history. The first decade of the 21st century inarguably was the Golden Age of Boston sports. The Red Sox not only ended 86 years of frustration with a World Series championship in 2004, but took a second in World Series in 2007. The 2007-08 NBA season saw the Celtics return to glory and capture their long-awaited 17th championship. (The Bruins continued to fail to live us to their legacy, but what can you do?) And, of course, it was the Patriots who led the way, playing in four Super Bowls and bringing home three Vince Lombardi Trophies in seven seasons. Not bad for a team that was once regarded as little more than an afterthought in the region and as a bad joke at best in the NFL. 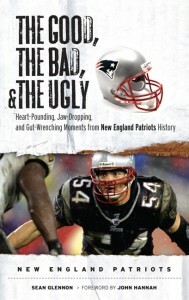 The Good, the Bad & the Ugly: Heart-Pounding, Jaw-Dropping and Gut-Wrenching Moments from New England Patriots History tells the story of how the AFL team considered least likely to succeed became the first dynasty of the NFL’s salary cap era. In 2002, the season following the Patriots’ first Super Bowl victory, Sean Glennon ventured out into Patriots Nation looking to get a sense of what makes fans tick and to see how the team’s success after decades of futility would change fans’ perspectives. He reported back what he found in a series of narrative essays published in the Boston Phoenix. And those essays formed the basis for This Pats Year. 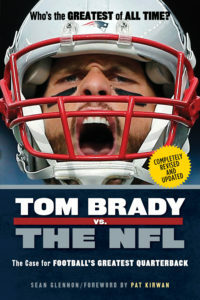 Published in 2004, the book expands on the Phoenix, turning the newspaper snapshots of Patriots fans into fully formed portraits of the New England faithful at the dawn of a new era in team history.